City in Palestine, scene of the war of Bar Kokba (132-135), and mentioned as such in Mishnah Ta'anit iv. 6; Yer. Ta'anit 69a; Babli Ta'anit 26b, 29a; Lam. R. to chaps. ii. 2 and iv. 8; Yer. Ber. 3d; Tosef., Yeb. xiv. 8; Bab. Yeb. 122a; Sanh. 17b; R. H. 18b, as well as in many other passages in Talmud and Midrash. The name is written in various ways: usually , but in the Cambridge and Hamburg MSS. (Ta'anit iv. 6), ; so also in "Halakot Gedolot," ed. Hildesheimer, p. 189, and Sherira's "Letter," ed. Neubauer ("Medieval Jewish Chronicles," i. 4, MSS. ); but ib. ii. 109, , the reading in Kohut, "Light of Shade," p. 41; , in Cant. R. to chap. ii. 17, but , Neubauer, ib. i. 171. These sources indicate that Bethar was a town of importance as early as the time of the destruction of Jerusalem, and was, moreover, the seat of a Sanhedrin; its inhabitants, who frequently suffered at the hands of the Jerusalem pilgrims, are said to have rejoiced exceedingly over the fall of that city. Bar Kokba made Bethar the chief base of the uprising against the Romans; and upon its suppression, Bethar—within the walls of which large masses of Jews had sought refuge—was closely surrounded by the Romans under Julius Severus, and was besieged for two and a half years (132-135); see concluding part of Seder 'Olam R. compared with Yer. Ta'anit 69a, and Lam. R. ii. 2, according to which this period of time does not refer to the duration of the war, but to that of the siege of Bethar; the war itself, according to Jerome (on Dan. i. 9, end), lasting three years and six months. During the war Bethar afforded shelter to an enormous population, which fact gave rise to exaggerated rabbinical accounts that Bethar had several hundred schools for children, and that the school youth boastingly declared that they could overthrow the enemy with their pen-reeds. When the stream, Yoredet ha-Ẓalman, ran dry in summer, the city began to suffer from want of water. The Samaritan Book of Joshua (ed. Juynboll, xlvii.) relates that the provisions, which were secretly conveyed to the town, suddenly, as if by miracle, ceased to be supplied. It is said that there were two subterranean passages leading from the city to Jericho and Lydda; that the Jews made use of them for the transportation of provisions; and that the Samaritans betrayed this secret to the Romans and thus brought about the fall of Bethar. Rabbinic sources (Yer. Ta'anit 68d; Lam. R. to chap. ii. 2) also speak of a Samaritan's treachery that, furthermore, caused the death of the pious R. Eleazar of Modin. Hence it may be concluded that Bethar was situated close to the Samaritan territory, and that the story of the underground passages to Jericho and Lydda can not be credited, for they are plainly features of the siege of Jerusalem, transferred to Bethar. 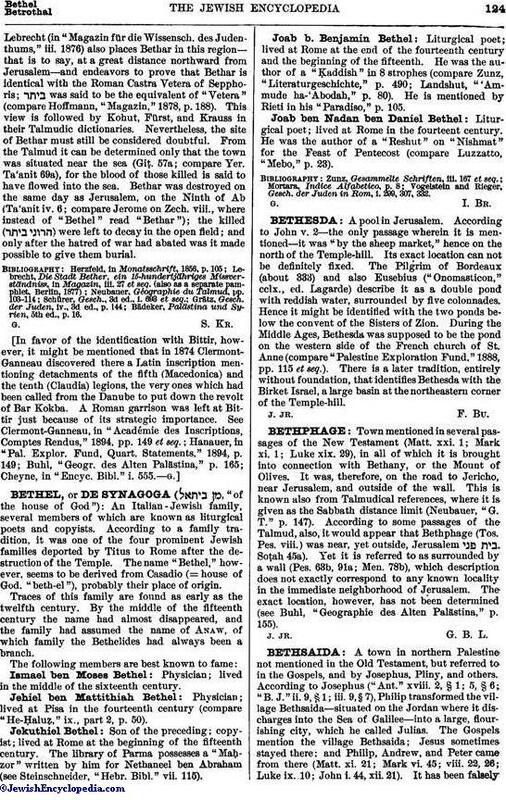 Neubauer is therefore incorrect in locating Bethar in the vicinity of Beth-shemesh, basing his opinion on the BαιΘάρ of the Septuagint on II Sam. xv. 24; for this place is not found in the Masoretic text, and thus no light is conveyed from that source as to its locality. Eusebius ("Hist. Eccl." iv. 6) calls the city BιΘΘηρα (variant BεΘΘὴρ, BηΘὴρ)—which agrees with the above-cited spelling, ; and he states that Bethar lay in the vicinity of Jerusalem. On this account Schürer and others (Ritter, Tobler, Derenbourg, Renan) identify Bethar with the modern Bittir, which is situated at a distance of three hours southwest from Jerusalem and contains the remains of an old fortification on a steep neck of land. The Bητάρις of Josephus ("B. J." iv. 8, § 1) is said to be different from this Bittir. If, however, Bethar had been situated near Jerusalem, it is inconceivable that Jerusalem should have taken no part in the war. Grätz ("Gesch. der Juden," 3d ed., iv. 144), on the other hand, declares the statement of Eusebius to be erroneous and locates Bethar north of Antipatris, four Roman miles south of Cæsarea. This would put Bethar in the neighborhood of Samaria.Lebrecht (in "Magazin für die Wissensch. des Judenthums," iii. 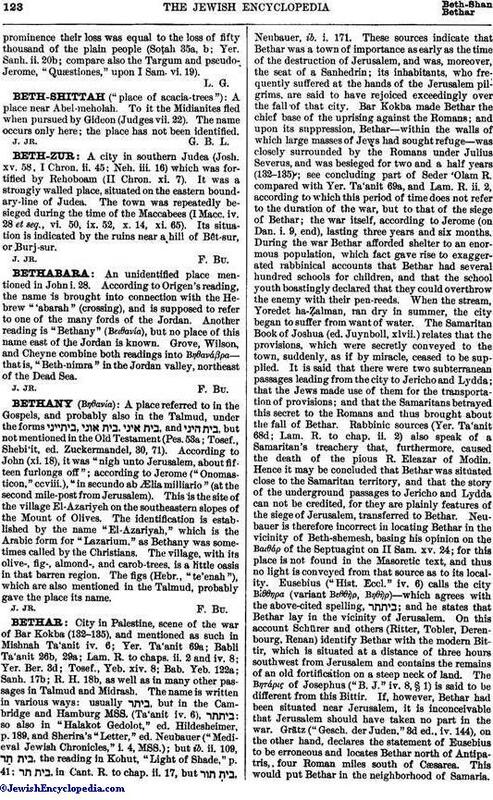 1876) also places Bethar in this region—that is to say, at a great distance northward from Jerusalem—and endeavors to prove that Bethar is identical with the Roman Castra Vetera of Sepphoris; was said to be the equivalent of "Vetera" (compare Hoffmann, "Magazin," 1878, p. 188). This view is followed by Kohut, Fürst, and Krauss in their Talmudic dictionaries. Nevertheless, the site of Bethar must still be considered doubtful. From the Talmud it can be determined only that the town was situated near the sea (Giṭ. 57a; compare Yer. Ta'anit 69a), for the blood of those killed is said to have flowed into the sea. Bethar was destroyed on the same day as Jerusalem, on the Ninth of Ab (Ta'anit iv. 6; compare Jerome on Zech. viii., where instead of "Bethel" read "Bethar"); the killed ( ) were left to decay in the open field; and only after the hatred of war had abated was it made possible to give them burial. Bädeker, Palästina und Syrien, 5th ed., p. 16. In favor of the identification with Bittir, however, it might be mentioned that in 1874 Clermont-Ganneau discovered there a Latin inscription mentioning detachments of the fifth (Macedonica) and the tenth (Claudia) legions, the very ones which had been called from the Danube to put down the revolt of Bar Kokba. A Roman garrison was left at Bittir just because of its strategic importance. See Clermont-Ganneau, in "Académie des Inscriptions, Comptes Rendus," 1894, pp. 149 et seq. ; Hanauer, in "Pal. Explor. Fund, Quart. Statements," 1894, p. 149; Buhl, "Geogr. des Alten Palästina," p. 165; Cheyne, in "Encyc. Bibl." i. 555.